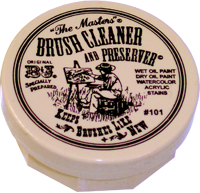 Since 1979, people have relied upon the Original B&J "The Masters" Brush Cleaner and Preserver to take special care in cleaning and conditioning artist brushes. The B&J formula is non-abrasive, yet effectively removes paints (including oil), inks, dyes, grass stains, grease, and grime. "The Masters" takes the effort out of cleaning up! Water washable oil brush cleaner. A safer way to clean brushes. Contains natural oils to restore brushes. Non-flammable. Biodegradable.